ABC’s hit dating competition reality show “The Bachelorette” may have some of the most attractive twenty-five male suitors in the show’s history yet! They are all vying for the arm of bachelorette Andi Dorfman, from “The Bachelor” Juan Pablo’s season, and they are all super-excited and extremely eager to date Andi. 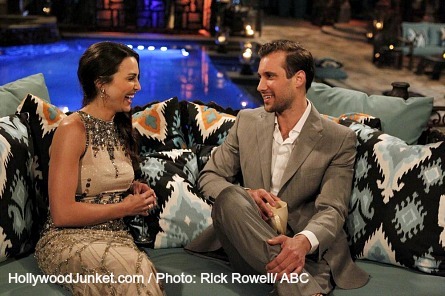 This season, “The Bachelorette'” introduces Andi who is a twenty-seven year old criminal lawyer from Atlanta. She was last seen saying goodbye to Juan Pablo after having a horrible night in “The Fantasy Suite” when Juan Pablo showed her he was blatantly disinterested in knowing anything about her. 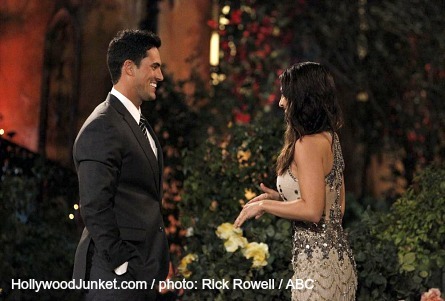 Andi is getting another chance at finding love on the dime of the ABC network with “The Bachelorette”. While getting ready to meet the men Andi stated, she’s going to give everything she’s got. She’s confident that she will find her husband this season, saying “I think I’m going to find that love that’s indescribable”. Andi’s sister dropped-by for a visit to help her get ready and reminded her of how spectacular she is – “You’re smart, beautiful. Any guy would be lucky to have you in their life. Don’t forget that” her sister told her. 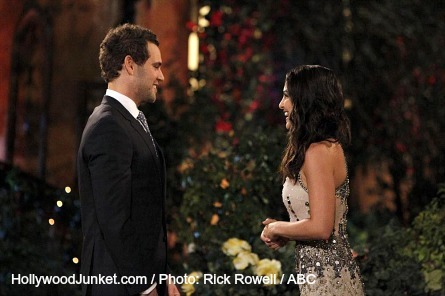 There are two repeats this season from the last season of “The Bachelor”. There’s another Opera singer and soccer player in the house again! Pictured: Andi gets to know Marcus. Pictured: Josh with Andi. She says he’s her type. The other promising suitors where it was obvious that the sparks were flying were Josh M. who is a 29-year-old former pro baseball player, and Dylan who is a twenty-six year old Accountant. He said he had to “warm-up” to her, but it was just a ploy to try and be memorable to her. Some of the other men whom stood-out were Chris, a 32-year-old farmer from Arlington, IA; Nick S., a 27 year-old a pro golfer, Bradley, a 32-year-old Opera singer, Emil, a 33-year-old helicopter pilot, Brian, a 27 year old basketball coach, and J.J. who called the show a “love quest”. Pictured: Andi had an instant connection with Nick. 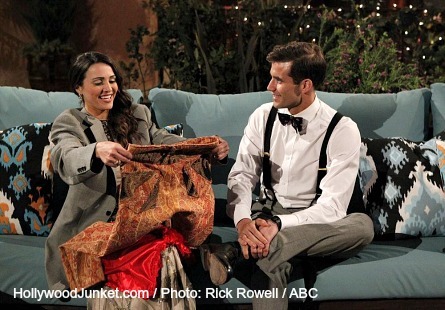 Pictured: Andi receives an unexpected gift. Some of the guys really went all out for Andi giving her personal gifts such as material from pants that one of the guys said it was the first ones he made, dolls, a lamp (Hmm! From the hotel! ), one dozen roses, golf lessons, and a cookie sampler platter! Andi mentioned several times that she is “not well traveled” to many of the men who are. Enter – Eric Hill who is an explorer and working on a travel documentary. One magical moment with Eric happened when he gave Andi two small dolls given to him from locals of another country who said they were for his girlfriend. He said he hopes that will be Andi (Awe! So sweet!). A encounter with a potential stalker from “The Bachelorette” Emily’s season and a Bachelor Pad season, Chris Bukowski decided to crash the private party by trespassing onto the premises down the hill from the house. Of course always welcoming any type of drama, one of the producers’ of the show had to consider Chris’ request to meet Andi and possibly join the group of men to compete for Andi’s hand. The ultimate decision, however, was left up to Andi if she would allow it. After conversing with almost all of her options, Andi is sure that she could find her husband “in there” she stated.